So, you’ve decided to roll out Teams to your IT team, a sub-set of users on a specific project, or your company at large. While the flexibility of the tool is one of its primary benefits, it can be overwhelming. Considering the wave of improvements that roll out frequently and the “Best in Show” awards as of late, we thought to outline a few best practice tips to help kick start adoption in your company and guarantee success. 1) Add a few tabs to help the team hit the ground running. A new team comes with three default tabs – Conversations (chat), Files, and Wiki. We add a OneNote for notes and a Planner tab for keeping track of tasks. 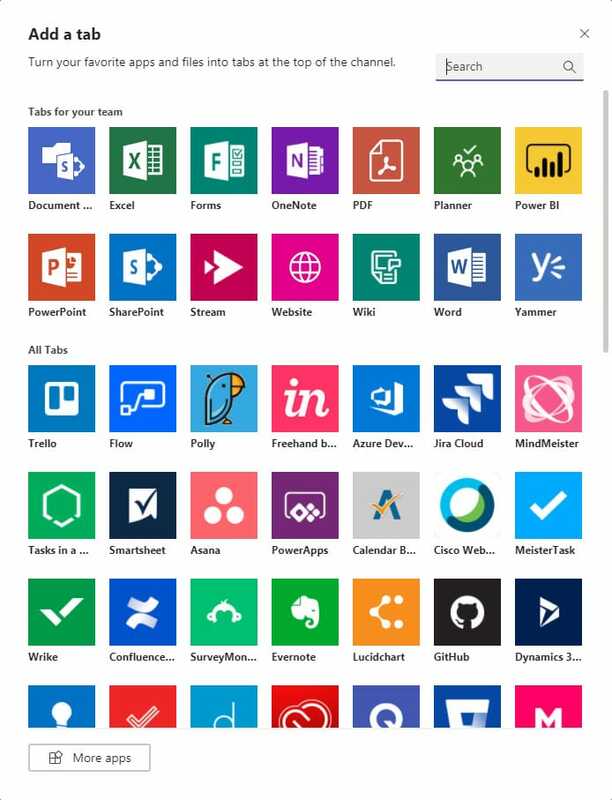 You can also add tabs for Azure DevOps, PowerBI, an external website, and Microsoft Office applications. Adding these tabs helps us “shortcut” our way to frequently used tools. Teams is now my number one starting place; all the tools I need are linked up there. Just because someone CAN see your comment in a Team doesn’t mean that they will. If someone needs to see something, make sure to @ mention them. We sometimes address chats with a series of @ mentions at the top, kind of like a To line in an email. And sometimes we add a cc: or attn: at the bottom of a chat with @ mentions for users that should be in the loop, but don’t necessarily need to chime in. 3) Open multiple organizations by using a browser and the app. If you’re a member of two organizations, fumbling back and forth between organizations is cumbersome. Also, you look “offline” to whichever organization you’re not actively logged into. You can resolve this by staying in one organization in the Teams app, and opening teams.microsoft.com in a browser and changing the organization to the external organization. 4) Replace internal email with Team conversations. After a few months of using Teams, our volume of internal emails decreased significantly making it much easier for all of us to keep up with our inboxes. This was most significant for sharing files – with the Files tab available, we spend a lot less time fishing through our inbox for the latest version of a file. So, if someone involved in a conversation is outside the organization, we lean towards email, but if it’s an internal discussion we try to keep it in Teams. 5) Create guidelines for your users. We have found Teams to be an awesome go-to application powered by Office 365 that helps us stay organized, communicate more easily, and toggle between apps, websites, and chat more efficiently. If you have questions about Teams or would like a demo of how this collaboration tool has helped our business please contact us here.